If you have a vegetable garden you know what this time of year is. Yes, zucchini overload! Now, there are tons of recipes out there for zucchini that are terrific. But I thought, why not do something a little bit different? I love Korean food and kimchee in particular. So, why not try using this wonderful summer squash in a spicy Korean relish? 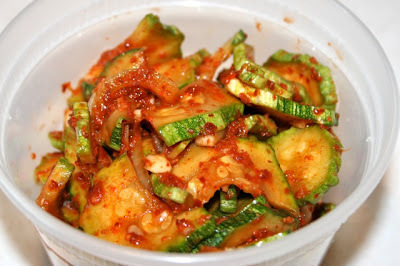 I looked around and there are few examples out there of zucchini kimchi but I do know that in Korea they make spicy pickles from all kinds of vegetables including summer squashes. What can be wrong with fresh vegetables, garlic, ginger and spicy red pepper? Nothing! I am happy to say my little experiment worked. I started with about 4 cups of zucchini sliced into 1/4 inch rounds. If the zucchini was too big around I split it into smaller pieces before slicing. The zucchini was sprinkled liberally with salt and left to stand for about an hour after which I rinsed the squash and drained it well. To make the kimchee sauce I used about 1/2 cup of Korean red pepper flakes 8 large cloves of garlic, 1 inch of ginger, minced, a tbps of sugar and about 2 tbsp of fish sauce. Green onions would have been best but I didn’t have any so I slivered up about one half of a large yellow onion into this as well. The pepper mixture was mixed well with the squash and it was placed in a jar to ferment for about 24 hours. I put it in the fridge after one day. This kimchee is not sour at all and I think I like it best freshly made. I used an Italian Costa Romanesca variety of squash that is my favorite. It has a great mild flavor when raw that matches well with the kimchee. One of the things I like to do with kimchee is to make kimchi fried rice. I had this for breakfast this morning. 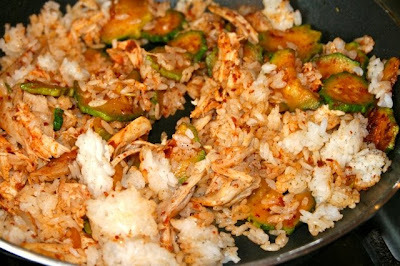 I just sautéed some of the kimchee in a bit of sesame oil, added some pieces of cooked chicken meat and then fried some leftover white rice with the whole mix. A breakfast only an Asian (and I) could love.